Singapore has been rolling out several key initiatives as a part of the nation’s Smart Mobility 2030 vision of a smart transportation network. As a result, it is seen strengthening its leadership in the development of autonomous vehicle (AV) technologies. The government has encouraged the driverless cars to operate, and now it is keen to see autonomous public bus services hit the roads. In an effort to enhance Singapore’s land transport system, the Land Transport Authority (LTA) has partnered with ST Kinetics to develop and trial autonomous buses. This is the fourth such agreement that LTA has signed. It has ongoing partnerships with the Energy Research Institute @ NTU (ERI@N) to develop and trial autonomous bus technology, as well as with Delphi and nuTonomy to conduct autonomous mobility-on-demand trials. The announcement was made during a ceremony chaired by the Permanent Secretary for the Ministry of Transport and Chairman of the Committee on Autonomous Road Transport for Singapore (CARTS), Mr. Pang Kin Keong. ST Kinetics, the land systems, and specialty vehicles arm of ST Engineering, known for its deep expertise in robotics and autonomous solutions, has given a proposal to develop and trial autonomous buses in order to enable LTA to explore if AV technology can meet this need. It will develop and integrate the AV technologies onto two 40-seater electric buses that can be employed to serve fixed and scheduled services for intra- and inter-town travel in the coming future. The buses will use a satellite-based Global Positioning (GPS) System and a suite of sensors to scan and determine their location and immediate surroundings to navigate autonomously. The buses will also be equipped with radars and sonars that are able to detect other vehicles and pedestrians up to 200m ahead. Also, ST Kinetics is working to enhance the autonomous buses’ ability to traverse in heavier rain conditions, up from the current 10mm/h to 30mm/h. Singapore’s need for high-capacity vehicles to address commuters’ peak-hour demands presents an opportunity for companies such as ST Kinetics to develop autonomous buses to address this latent demand. This is also in line with the whole-of-government effort to explore and apply smart technologies to improve our lives. 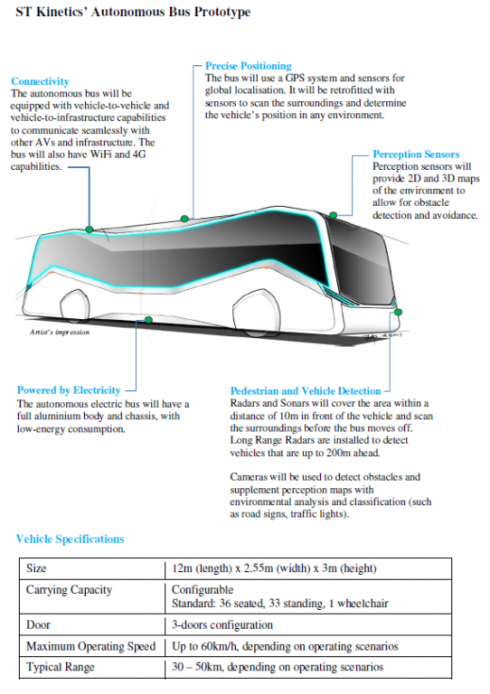 The project will encompass the trials of the autonomous buses in different environments. LTA has collaborated with stakeholders such as the National University of Singapore (NUS) and JTC to finalize suitable trial locations, which can potentially include Jurong Island and NUS’ campus. The three-and-a-half year project will conduct the testing during off-peak periods at an industrial area where the road infrastructure is less complex. As the buses will be equipped with more advanced capabilities over time, they will be progressively introduced to more complex trial sites. ST Engineering has also unveiled the Singapore Autonomous Vehicles Consortium to facilitate and strengthen collaboration between industry partners and institutes of higher learning to develop AV standards as well as accelerate the application and adoption of AV technologies in the nation. The consortium includes A*STAR’s Institute for Infocomm Research (I²R), Singapore University of Technology & Design (SUTD), National University of Singapore’s (NUS) Faculty of Engineering, Nanyang Technological University (NTU) through the ST Engineering-NTU Corporate Lab and Singapore Institute of Technology (SIT). It will direct its focus at two prominent areas – to identify protocols and standard for the adoption of AVs in real-world scenarios; and to create niche AV technologies such as automotive cyber security, advanced autonomy, and platform-agnostic AV kits through a build-test-deploy spiral approach.